Grain SA is an autonomous industry organisation that acts in the interest of the grain producer in South Africa. Membership is subject to a voluntary commodity levy that is approved during the annual Congress. Should more than one producer be involved on the same farm, they can obtain membership as linked members. Linked members have the same member benefits as a normal member, provided the fees are paid-up for all the members. How do I become a member of Grain SA? Any producer who produces grain may obtain membership by completing the authorisation form available either from Grain SA’s office or on the website. After receiving the authorisation form, Grain SA forwards it to the collection agent, where the delivery of grain is to take place. With the form you, as producer, therefore authorise the relevant agent to deduct the levy from your account and pay it over to Grain SA. Upon receipt of the authorisation form, you are registered on Grain SA’s database. What does it mean to be paid-up? Full membership comprises a minimum payment of R1 000 (plus VAT: R1 140) and needs to be calculated annually per tons delivered. The authorisation stays valid until Grain SA receives written notice to cancel the authorisation. Example 1: If you produce 70 tons of maize, it is 70 t x R2,50 = R175. This means that you must then pay R965 extra to reach R1 140 to be a full member. Example 2: If you produce 100 tons of soybeans, it is 100 t x R5,00 = R500. This means that you must then pay R640 extra to reach R1 140 to be a full member. The financial year stretches from 1 March to 28 February of any given year. Paid-up members can attend the Grain SA Congress as voting delegates and also qualify for free entry to Grain SA’s NAMPO Harvest Day. The commodity levy (as approved at Congress 2016) is reflected in Table 1. Grain SA entered into agreements with agribusinesses and grain off-takers who provide support in recovering levies on behalf of Grain SA. However, a lot of grain is currently being loaded directly at the farms. Therefore it remains the producer’s responsibility to pay his levy to Grain SA in order to remain a paid-up member. If a member delivers his grain at one of the registered collection agents, it remains the responsibility of the member/producer to consent to the deduction of the levy. 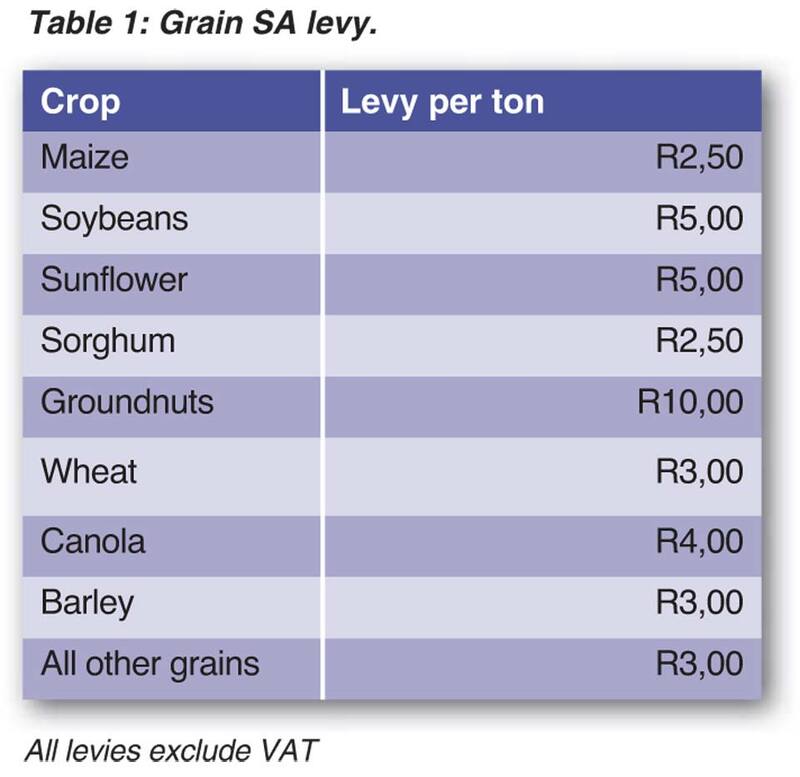 If you as producer prefer to pay your levy for tons delivered directly to Grain SA, the proof of payment as well as the details of the type of crop must be sent to Patricia Mahlatsi via email at patricia@grainsa.co.za, or faxed to 086 509 7173. Patricia’s contact number is 012 816 8035. It is very important to also include your VAT number (should you have one). Grain SA will then issue you with an invoice. Member communication is vital and the accuracy of the Grain SA database is therefore important. If you complete the authorisation form, your contact information can be updated – be it email address or telephone numbers – ensuring that every producer receives the relevant Grain SA communication. Market information is sent to members daily via email. SA Graan/Grain (supplying information on current affairs and industry information) is mailed to members monthly. Electronic letters are sent to members fortnightly. SMS messages also form an integral part of communication with members. It is therefore important for the organisation to have your correct cell phone number. Relevant information and events can also be found on Facebook (www.facebook.com/grainsa/) and Twitter (@GrainSA). Visit Grain SA’s website, http://www.grainsa.co.za, for more information. Ensure your own peace of mind and become a member of Grain SA. Call Patricia Mahlatsi (086 004 7246) or send an email to her at patricia@grainsa.co.za or to Elray Stuurman (elray.stuurman@grainsa.co.za) for any enquiries about your levy. Article submitted by Dirk Kotzé and Toit Wessels, Member Marketing and Communication Officers, Grain SA. For more information, send an email to dirk@grainsa.co.za or toit@grainsa.co.za.